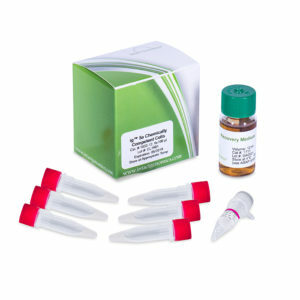 Intact Genomics 10B BAC electroCompetent cells are suitable for demanding cloning situations, such as BAC library construction and large construct transformation or cloning difficult targets, requiring the greatest number of transformants possible. ≥5 x 1010cfu/µg efficiency with electroporation. 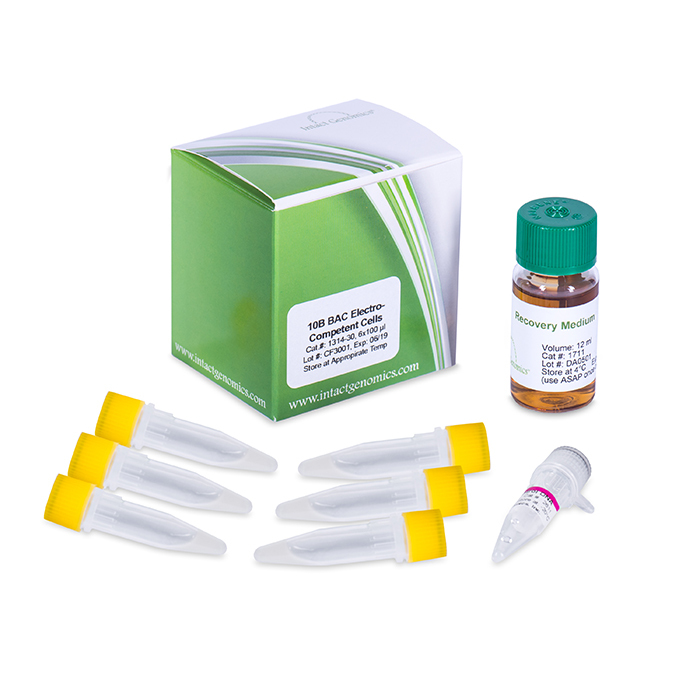 Transformation efficiency is tested by using the pUC19 control DNA supplied with the kit and using the protocol given below. Transformation efficiency should be ≥5 x 1010 CFU/µg pUC19 DNA. Untransformed cells are tested for appropriate antibiotic sensitivity. 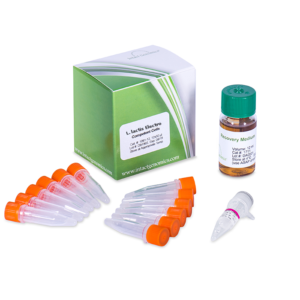 Handle competent cells gently as they are highly sensitive to changes in temperature or mechanical lysis caused by pipetting. 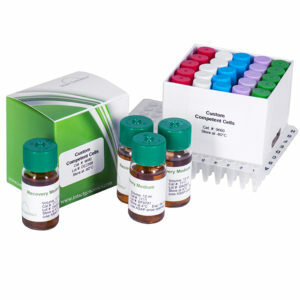 Thaw competent cells on ice, and transform cells immediately following thawing. After adding DNA, mix by tapping the tube gently. Do not mix cells by pipetting or vortexing. Note: A high-voltage electroporation apparatus such as Bio-Rad Gene Pulser II #165-2105, capable of generating field strengths of 16 kV/cm is required. Transformation Efficiency (TE) is defined as the number of colony forming units (cfu) produced by transforming 1µg of plasmid into a given volume of competent cells. Use this procedure to transform Intact Genomics 10B BAC ElectroCompetent Cells. Do not use these cells for chemically transformation. Place sterile cuvettes and microcentrifuge tubes on ice. Remove competent cells from the -80 °C freezer and thaw completely on wet ice (10-15 minutes). Aliquot 1 µl (1 pg-10 ng) of DNA to the chilled microcentrifuge tubes on ice. When the cells are thawed, add 20 μl of cells to each DNA tube on ice and mix gently by tapping 4-5 times. 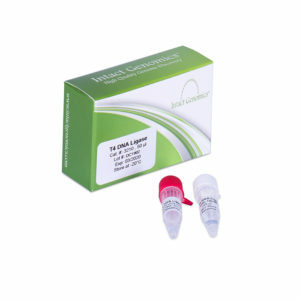 For the pUC19 control, add 1 µl of (10 pg/µl) DNA to the 20 µl of cells on ice. Mix well by tapping. Do not pipette up and down or vortex to mix, this can harm cells and decrease transformation efficiency. Pipette 21 µl of the cell/DNA mixture into a chilled electroporation cuvette without introducing bubbles. Quickly flick the cuvette downward with your wrist to deposit the cells across the bottom of the well and then electroporate. 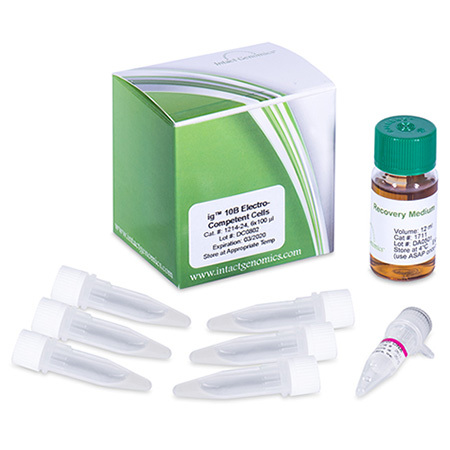 Immediately add 979 µl of Recovery Medium or any other medium of choice to the cuvette, pipette up and down three times to re-suspend the cells. Transfer the cells and Recovery Medium to a culture tube. 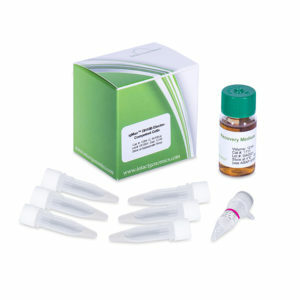 Incubate tubes at 37 °C for 1 hour at 210 rpm. 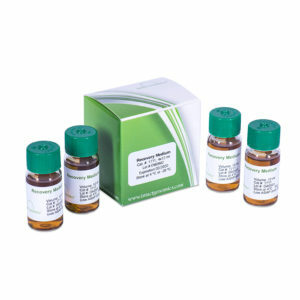 Dilute the cells as appropriate then spread 20-200 μl cells onto a pre-warmed selective plate. For the pUC19 control, plate 50 μl of diluted transformants onto an LB plate containing 100 μg/ml ampicillin. Use sterilized spreader or autoclaved ColiRoller™ plating beads to spread evenly. Incubate the plates overnight at 37 °C.